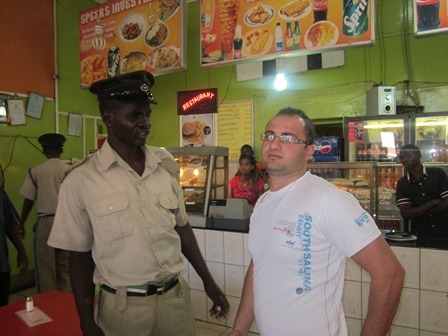 Kabwe district commissioner Patrick Chishala is reportedly interfering in the assault case where a Lebanese Take away shop manager Nabil El Raie is beat and injured his former employee Kelly Mwansa last week byhitting him with a rolling pin on the forehead and sustained a deep cut.And the Lebanese owner of the shop has accused Daily Mail of inciting people to take vengeful action against him and causing damage to the business reputation, Mohamed Jaber has since demanded that Daily Mail retracts the story or face legal action.Sources from the DC’s office disclosed to the Zambian Watchdog that Chishala had a meeting with Mwansa, El Raie and Jaber and advised that the warring parties be reconciled by directing Mwansa to withdraw the matter.”After the story came out, Jaber and some other Lebanese have been frequenting the DC’s office and it looks like he is trying to mitigate on behalf the Lebanese national, we understand that the DC is the one who initiated the idea of asking Daily Mail to withdraw the story and on Monday a meeting was organised where differences were supposed to be buried,” said the source. The source further added that Chishala was particularly worried especially that immigration department last week summoned El Raie and feared that if the police case is not withdrawn, the Lebanese national risked being deported once found guilty. And a worker from the take away shop told the Zambian watchdog that El Raie was back in his job and boasting that “nothing would ever happen to me.” The move has upset the workers who fear that he will not stop his heinuous actions. The workers have maintained that El Raie was a relative to Mohamed and a partner in the business. Meanwhile Jaber has dismissed the Zambia Daily Mail story and accused the sate owned newspaper of inciting people against his business. Jaber has also stated that El Raie is not a partner but only a manager in the business. In a copy of Jaber’s letter obtained by the Watchdog, Jaber says the story misrepresents the truth. “Editor, we find this story to be misrepresenting the truth, one sided, malicious and capable of causing irreparable damage to our well established business reputation in Kabwe, it is also capable of inciting people to take vengeful and violent action against us hence our request for you to retarct the story and publish the correct version as we hereby give to you,” read the letter addressed to Daily Mail editor and dated 13th April, 2013. The letter also demands that a written apology be written and circulated in the paper both electronically and in print within 48 hours of receipt of the letter failure to which legal redress will be sought. The letter is said to have been delivered on Monday but to date no statement has come out from the Daily Mail. El Raie has since been charged by police for a lesser offence of Assault occassioning actual bodily harm contrary to section 248 cap 87 of the laws of Zambia and has been relesed on police bond. “He was initially supposed to be charged with unlawful wounding, since he used an object to injure the victim,” said a policeman from Kabwe central police who sought anonymity.